As the architect of Gateway Asia – a business led, knowledge driven B2B bi-lateral trade support initiative, my associates and I have supported some 200 micro, small and medium-sized enterprises (MSMEs) looking to do business abroad. I was the Chief Executive of the former Heathrow City Partnership – a British Government and private sector undertaking led by Heathrow Airport Limited dealing with £135m investment in complex regeneration, economic development, enterprise support, workforce skills and transport projects in the area. I was the leader of West London Task Force, a £10m inner cities regeneration and community cohesion initiative for the North Kensington and Shepherds Bush areas, and Business Development Director, Government Office for London, where I managed £100m of central Government investment in skills, enterprise and regeneration programmes and initiatives delivered by local authorities, various business associations, universities and further education colleges in West and Central London. 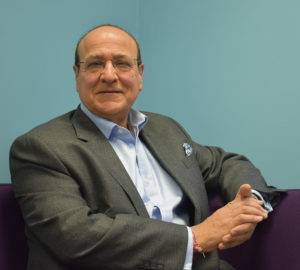 I am a qualified HRD professional and an Honorary Fellow of Brunel University, Fellow of the Royal Society of Arts (FRSA), Member of the CIPD and a founder member of West London Business Chamber of Commerce, and have been involved in running family restaurants and retail and property businesses since the late 1960s. I was included in the Asian Power 100 September 2005 and September 2007 publications as one of the key influencers on Asian matters in the UK, and was the Joint Author of the report commissioned by Ministers on the “Review of the Employment Department Group’s Policies, Practices and Procedures on Race Relations in Employment”. I have been specialising in regeneration, economic development, enterprise and business support, international trade, and financial wellness consultancy work targeted at SMEs, as well as healthcare and community cohesion assignments for over a decade. I have an extensive business, professional and social network built up across the private, radio and TV, central and local government and voluntary and community sectors in many countries. My current UK and overseas consultancy, mentoring and marketing assignments vary in scope. These include: business planning and raising investment for major private sector projects, such as the London Eye in Ahmedabad, Gujarat, India; Gujeong – Gangneung District Low Carbon City Development Project, East Coast Free Economic Zone, South Korea; setting up primary healthcare services in Punjab, India, a tourist and retail parade in Morocco; business diagnostics for 6 high-growth SMEs; and business development strategy for a CIC that supports vulnerable people and those suffering isolation and loneliness across East Berkshire. Talk to me about my diagnostic work, business health reviews and mentoring services to help you and your organisation to grow and/or diversify in the UK or internationally, and benefit from my networks here and in emerging markets, especially in the Indian Sub-Continent, South Korea, Mauritius, and East Africa.